I’ve seen some SF novels described as being ‘cosy catastrophes’, I think Intrusion could be described by a related term, ‘cosy dystopia’. The world the characters live in (a near future Britain) is superficially pleasant and at the start of the novel they’d probably say they were genuinely content with their life, but despite that this is clearly a dystopian novel. One of the effective parts of the book is how Hope Morrison’s life gradually falls apart and her discontent grows with the world she lives in, all beginning with a single small act of rebellion where she refuses to take a pill while pregnant that would cause her child to grow up genetically immune to most diseases. Many of the other characters in the book are frustrated with her inability to explain why she’s refusing to take the pill, and even in her internal narrative she doesn’t seem to be doing it out of any deeply held conviction. I’ve read some of the other reviews of the book and many readers seem equally frustrated by her actions but I think they do make sense, it is perhaps irrational but I think her refusal is clearly an expression of her frustration about not being given any choice in how to live her life. I think in most ways the portrayal of the dystopia is effective, in terms of showing how oppressive even a generally benevolent society can be against those who transgress against its norms. One thing that works well is that it doesn’t take the easy option of having some sinister conspiracy to be uncovered, it’s a portrayal of a society that does things varying from frustrating to horrific while all the team believing it is acting in the best interests of its people. The society does to be an intentional exaggeration of modern society, some elements can feel a bit caricatured but it works well enough as satire even if it sometimes struggles to be plausible enough to be taken entirely seriously. Perhaps the oddest feature of the novel is the mix between the fairly mundane near-future setting and one of the major plotlines in which Hope’s husband is revealed to have vivid visions of an alternate or future society, the two plotlines coming together when he takes his family back to his childhood home on the Isle of Lewis (it wouldn’t be a Ken MacLeod book without at least one visit to Scotland). It’s a reasonably interesting plotline but it feels a bit fantastical and out of step with the rest of the novel. It does all end up with a fairly satisfying ending, although there are probably a few subplots along the way which maybe didn’t add much to the novel. MacLeod’s writing has always been easy to read and this is no exception (aside from the occasional lecture on political philosophy). Hope and her husband are both interesting and complex characters, and I think the fact they would sometimes struggle to explain why they’re doing what they are doing is actually fairly realistic. Some of the supporting characters feel a bit simplistic and only there to deliver a particular viewpoint, but I think the lead characters have enough depth to make up for that. 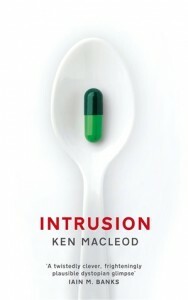 Intrusion is a slightly difficult book to rate because it has plenty of interesting ideas, does some things well, but ultimately seems to fall short of being as good as it could have been – something it has in common with MacLeod’s previous few books. I wouldn’t say it is entirely a success but I think there’s enough done well for it to be worth reading.